When Azure's principal gives her the chance to turn the school's traditional (and boring) senior prom into an event that will appeal to everyone, not just the jocks and cheerleaders, she jumps at the opportunity. Soon Azure manages to convince her best friends, Luke and Radhika, to join the prom committee as well. Facing heavy opposition and admittedly clueless about prom logistics, the three friends are nonetheless determined to succeed -- if Luke's and Azure's secret crushes on Radhika don't push the committee members, and their friendships, to the breaking point first. 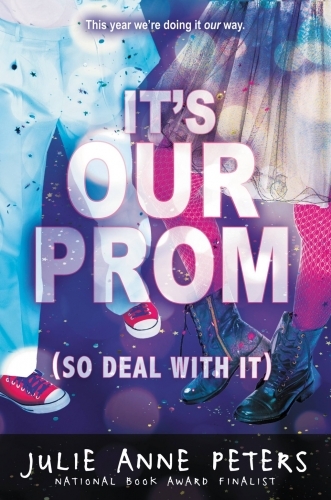 Told in two voices and filled with comical missed connections, It's Our Prom (So Deal With It) explores the ups and downs of planning an alternative prom -- while dealing with an unrequited crush on your best friend -- and shines with National Book Award finalist Julie Anne Peters's unmistakable wit and insight. "A fun read about a Denver high school whose idea of inclusivity goes beyond the norm to include all 'geeks, freaks, and uniques.'" ( School Library Journal). 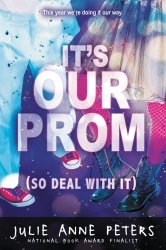 "There are plenty of comedic missed and mixed messages...Romance readers will enjoy this alternative peek at prom." ( Booklist ). "This engaging story explores some serious themes, but always with a light and humorous touch." (VOYA). "Refreshingly realistic...a highly readable tale with a little something for everyone." (The Bulletin). "The story of friends, family, and lovers will pull readers into the deeper themes of trust, rejection, and intimate secrets revealed." (Booklist). "A warm and substantive character study and a welcome addition to stories about LGBTQ teens." (Kirkus Reviews).